Check out the Carrack website and Facebook for more info on tickets sales and programming, tips on costumes & more! Tickets for The Muse Masquerade are $75 and go on sale September 14th. WA is pumped to dig back into Frivolous Artist with Sculpture Garden featuring violinist Zach Aliotta and mover Carley McCready! We’ll be opening up for CAVE and new local band Corroder will be in the middle. A solid line up for sure. CAVE (https://cave.bandcamp.com/) - Drag City kraut/psych explorers with a new record on the way: "The air's gone electric...tremors shaking the place! CAVE have been off on a trip — a brief, blissed glimpse into the infinite, and they've brought a generous dose back to us. Loaded with space, groove, and rock — Allways!" Doors @ 8:30 PM | Music @ 9:00 PM | $5 or free w/ Duke ID | venue is BYOB! Reflex Arc back at Hopscotch for a (freeeeee) Neptunes Day Party! RA's back in Raleigh to get in on the Hopscotch action. This is a killer line up with a few locals and a couple out of towners! Neptune's - - - 14 W. Martin St.
All Data Lost is a new fest dedicated to highlighting experimental/noise acts in NC and beyond. It serves to help build connections between artists in order to strengthen and grow fringe art in NC. Ginger's headed to Asheville to meet up and collaborate with other NC improvisers!! An evening of paired improvisations between one musician and one dancer with no preparation or rehearsal. Experimental, unplanned and unrepeatable. COMPANY and collaborators Heather Gordon, Alex Maness, and Chris Fleming will inhabit The Fruit on July 11-15, 8pm every night, to present SHOW. Part 1, audiences are invited to set their own pace as they visit active performance sets in the warehouse. Gordon creates an installation in real time and performers contend with visibility. Part 2, visit a new choreographic work by COMPANY that unfolds inside a set of light and projections created by Fleming and Maness. 3 CHANCES to join us! An invitation. A clanging sound. A permutation. Frivolous Artist: More Metal is an interactive live sound and movement installation. Audience/participants are invited to help build the installation and push against polite social boundaries while handling and moving scrap metal around the room. As movers Patience and Ginger Wagg attempt to pile as much metal on Ginger's body as possible, musician, Mike Geary, will capture live sounds and weave them into the soundscape. Reflex Arc at Food For Thought in Winston! Wild Actions & Mike D. present LITU at SwitchPoint! Wild Actions is over the moon to be able to collaborate with Mike Dimpfl to create the first installment of this large-scale installation. Leaving Impossible Things Unattended is a site and viewer specific performance tracing the relationship between our bodies, the body politic, and the garbage we think we can leave behind. Part call-to-action, part call-and-response, it evokes a problem and the games we struggle to play in our daily life to avoid responsibility. You can play, but you don't get to make up the rules. Can you get out of the way? Should you? Will you? SwitchPoint is a conference about creativity, partnership, and action. It’s where humanitarian innovation, global health, and technology collide. It focuses on unusual collaborations, spreading great ideas from around the world, and incubating yours. It’s all accomplished in a retreat setting down by the riverside in historic Saxapahaw, North Carolina. Come get away from it all, and get into it all! To engage with Durham dance-goers in a new format, we've created DIDA Book Club. Every Weds. following a DIDA performance, you're invited to discuss the work over wine in a laid-back environment. To facilitate, we have selected a group of people who we know to be highly personable and adept at critically processing dance. Why not have post-performance discussions after each show? DIDA thinks that interesting dialogue might happen when people have had a few days to process their experiences as audience members. DIDA Book Club takes this conversation outside of the performance environment, and in doing so, creates space for a more robust discussion about each individual work. Similar to a book club where the author is not involved in the discussions, the producing artist(s) will not be present at DIDA Book Club events. DIDA Book Club events will be held at Bar Brunello each Wednesday following a DIDA show on Season 4. Drink specials will be offered to participants at each event. We hope you'll help us spread the word about DIDA Book Club! We look forward to connecting with you! Frivolous Artist is an hour long movement based performance installation. This experience will begin outside The Fruit Co and then travel to 5 different locations in and around the building. Visit our storefront to buy tickets! Wild Actions invites you to help us KICK THIS THING OFF! We're almost at 1/4 of our fundraising goal to pay for artist fees, venue rental, costumes, installation materials, videography & photography & promotional material. Help us get the rest of the way there! before that we wanna HANG OUT, DANCE, and CELEBRATE all that it takes to put up a show in the year 2018. DJKB will be on the decks. Snacks potluck style (bring a thing to share if you're into it). Ginger Wagg taking a bath in a fancy clawfoot bathtub filled with YOUR cash money. Plus specials guests & more...stay tuned for what's to come! Come on over for a minute or stay for a couple hours! All donations to Wild Actions are now tax deductible through Fractured Atlas! **Also, we need your help to gather as many used plastic bags as possible for our next project, Leaving Impossible Things Unattended, with collaborator Mike Dimpfl. Consider bringing us your bag of bags of bags instead of dropping them in the recycling bin. Our goal is to gather oh just ya know 1,000-2,000 - no biggie. Donate a bag of used bags and get a door prize! *Wild Actions is a sponsored project of Fractured Atlas, a non-profit arts service organization. Contributions for the charitable purposes of Wild Actions must be made payable to "Fractured Atlas" only and are tax-deductible to the extent permitted by law. O Moldy Night at The Durham Hotel! Sunday March, 4th, 5-7pm, The Durham Hotel / FREE! Wild Actions will be presenting/performing their molded food contribution along with 40 other contributors including The Lakewood, The Pig, Panciuto, Neal's Deli, Bill Thelen, a beloved grandmother, award-winning chefs, artists, home chefs, and more! Molded merch for sale by Parker & Otis. Join Lump Projects on Friday, February 23rd in Specular Sounds Part II ~ Extending Her Vortex an exploration of queer/femme-ness as holistic spectacle through a showcase of seeing, hearing, and moving. Doors open at 8 starts at 9-late. Amanda Barr & Ginger Wagg are teaming up to bring you a spooky quirky roaming performance during the Muse Masquerade fundraiser for The Carrack Modern Art! Join us on October 27 at 21c Museum Hotel Durham Nc for an immersive evening of music, theater, dance, tarot, poetry, and circus arts at The Carrack Modern Art's third annual fundraiser, The Muse Masquerade! Full info & tickets at thecarrack.org/muse, or read on! For the third year, The Carrack will transform all three floors of 21c Museum Hotel Durham Nc into a music-and-art-filled labyrinth for 500 masked guests. Partygoers will be treated to a non-stop evening of entertainment that includes interactive performances, music, dancing, tarot, custom poetry, live art, aerials, and an all-night dance party. Tickets are $65 and are available beginning September 15, 2017. As in past years, costumes remain a hallmark of The Muse Masquerade. Guests are encouraged to don masks and outrageous garb and, for one unpredictable night, channel their wildest inner "muse." Guests can prepare in advance at Pop-up Shops featuring costumes from the Little Green Pig Theatrical Concern and local mask artisans and vendors, plus art activities for the whole family. This year we are raising the stakes! A 2018 Muse Masquerade ticket will be awarded for categories of best mask, best costume and best group costume by a selected panel of fashion-forward jurors. Due to 21c Museum Hotel Durham’s generous partnership, we're pleased to offer Muse Masquerade guests a discounted rate for hotel rooms on the night of 10/27/17. Full info is available at http://thecarrack.org/stay-the-night. Proceeds raised at The Muse Masquerade support The Carrack in 2018. 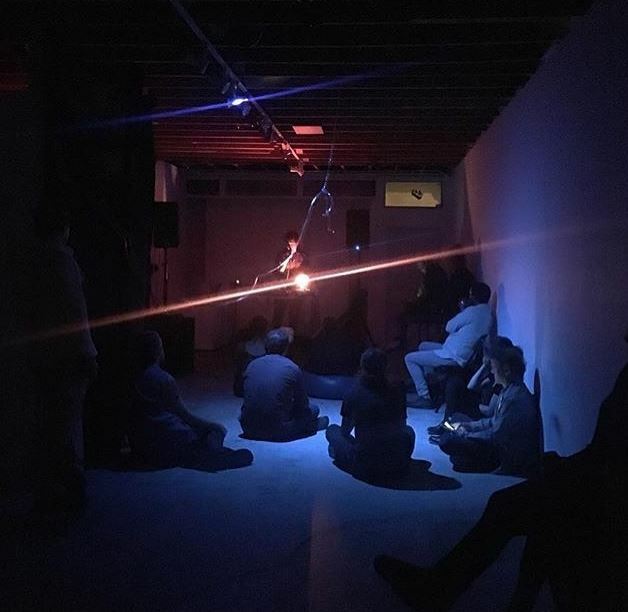 The Carrack was founded in 2011 and is a free, zero-commission community art space that provides exhibition and performance opportunities to underrepresented artists, and space for community-focused events. We are 100% supported by grassroots donations. Funds raised at The Muse Masquerade support the artists participating in the event and help make possible 20+ annual exhibitions, 50+ annual performances, and numerous workshops, gatherings, and events at The Carrack each year, all at no cost to artists and organizers. Most of our programming (gallery hours, bi-weekly artist talks and receptions, monthly drawing workshops/concerts/art salons and more) is also free to attend year-round. Our goal is to raise $30,000, half of our annual operating budget, from tickets sold for The Muse Masquerade. We'll work to raise our remaining budget through a crowdfunding campaign following the event. For more information about The Carrack and how to support this project, please visit thecarrack.org. Promote your brand to 500 of Durham’s most creatively inspired guests at The Muse Masquerade while supporting its only zero-commission community art space. Find out about corporate sponsorship opportunities at thecarrack.org/sponsorship. Thank you to our 2017 Sponsors & Partners: 21c Museum Hotel Durham, The Fruit, Hamilton Hill Jewelry, HappyMess Art Studios, Classes & Supplies, Caktus Group, Durham Magazine, MAXX Adult Emporium, Net Friends, The Floor, Imagine Circus, Eno Ventures, Addled Muse Fire Theater, Moogfest, Smashing Boxes, Beverly and Robert Atwood & the Fab Femmes, INHABIT, Durham Distillery, and Brother Vilgalys. Reflex Arc & Daniel Levin will improvise and play. Cellist Daniel Levin has been a major presence on the New York scene for nearly two decades as an active bandleader and as an innovative sideman. A recipient of a Jerome Foundation award, he has released more than 20 albums as a leader or co-leader on labels such as Clean Feed, HatOLOGY, Not Two, Trost, Riti, and others. This performance finds him in the midst of a southern US tour in support of his new solo record, Living, scheduled for release by Smeraldina-Rima on September 15th. 9pm & 10pm - FREE! 8:30PM - real.live.people (durham) will perform "'and what about this' and other false starts", exploring the self-criticism and self-doubt that exists within the echo chamber of a solo creative process. 8:45PM - ShaLeigh Dance Works will perform an excerpt of 'I Promise', drawing on the imagery of rioting and rebellion to question how we define our tribe, what connects us, and what separates us. The full-length work will be presented in December 2017 as part of the DIDA 2017 season. 9PM - Ginger Wagg & Wild Actions will perform an excerpt of 'Frivolous Artist', a full length show that will be presented in March 2018 as part of the DIDA 2017 season. WHY: because the arts scene in Durham is not complete without the dance! HOW: by the immense generosity of some very fine folk. **Proxemic Media is a new local dance service and production organization! Read their statement below & check out more info here. Proxemic Media, simply put, believes that artists should be able to have full focus on developing their craft and artistic vision without having to also handle the administrative details. More often than not, artists have to be their own administrators – seeking a venue, raising funds, handling marketing, and their work is undoubtedly affected. But, what happens when an artist has access to an affordable, customizable, pro-active arts administration team who can aid in manifesting his/her vision? Answering this question is the primary mission of Proxemic Media. PLAUSIBLE WORLDS presents a site-specific outdoor performance by Ginger Wagg in collaboration with Jaclyn Bowie, featured video artist. Viewers are invited to participate in a silent tour of the alleyway park and enjoy environmental enhancements provided by Bowie and Wagg. PLAUSIBLE WORLDS is presented by Raleigh Arts, a division of Parks, Recreation and Cultural Resources. The City of Raleigh and the Office of Raleigh Arts gratefully acknowledge First Citizen. Block2 on view May 15 – September 30, 2017. Reflex Arc plays its first long form endurance show as part of Under Pressure, the VAE's first performance art series. We'll start at noon and go as many rounds as we can! Reflex Arc is one of eleven performance projects/artists chosen to take over the VAE gallery during the month of July. More info here & here. JASON LESCALLEET - Nightlight is always excited to host this electro-acoustic sound explorer / innovator from Maine. The methodology of his performances varys, from tape-based applications to hi-definition digital expressions and various avenues in between, the results are unique, varied, mind-expanding excursions into the world of sound... DO NOT MISS THIS NIGHTLIGHT FAVORITE!!! CHEER-ACCIDENT - This long-standing, Chicago-based ensemble led by Thymme Jones will be making their first appearance at the club. They're touring in support of their 18th(!!!) album (and third on the Cuneiform label). Local music maker and curator Ryan Martin continues to blast us out into space in this 6th year of Savage. Nightlight Bar & Club hosts 2 days of back-to-back 15-minute sets from over 80 sound/music/noise/beat makers coming all the way from Berlin to Kansas City to New Orleans and NC. NGO, NAKATANI GONG ORCHESTRA, is a contemporary live Sound Art project that tours throughout North and Central America. NGO is a continuous, growing community engagement project; and the only bowing Gong orchestra in existence in the world today. The rich harmonies produced from multiple layers of bowed gongs are transformative, engaging and inspiring for both players and audiences. The gong bows and surrounding instrumentation equipment are handmade by Nakatani Kobo. For each performance, participating gong players are selected by a local presenter. Nakatani gives a specialized training workshop to gong players in preparation for the performance. Players will also experience Nakatani’s own unique point of view regarding Gong techniques, and will experience undiscovered dimensions while immersed in the vibrations and sounds during a training workshop. Nakatani is the composer and conductor for the evening of the performance. In a scene where bands hatch and dissolve, sometimes in the span of months, North Elementary have been stalwarts who continue on with a determined pacing that’s lent them a longevity other groups can only envy. Thiers’ is a history that one could spend paragraphs unravelling, but let it suffice to say that over more than a decade of music with 7 full lengths and various EPs and 7” releases under their belts, North Elementary have plundered and explored the cosmic depths of rock and roll. Their forthcoming 8th full length, “And Every Color You Have Ever Seen” is a document of the group’s curiosity and restlessness. There’s more space left to be explored, and they are happy to rocket into that unknown with discovery on the brain. That’s not to say that North Elementary has forsaken what they do best. There are still starry-eyed lyrical musings paired with six-string supernovas. Psychedelic textures are still punctuated by aggressive counterpoints. Harmonies and hypnotic keys create a nebulous rainbow that fill the void between solar systems. And all the while the well-tuned rhythm machine serves as an engine that never fails to push the group wherever the ship gets steered. The differences here are mostly in time, not texture. Previous releases have leaned towards songs that stretch out and get where they want to go… eventually. Most of the tracks on “And Every Color You Have Ever Seen”, however, clock in around three and a half minutes or less. This just might be the first proper Pop record that North Elementary has recorded. While most groups start pop and end up experimental, North Elementary have never been ones to do things conventionally. With their collective experience they have managed to incorporate the aforementioned hallmarks of their sound in a more concise structure, and it works to great effect. This record is full of songs that feel longer than they actually are, and still end earlier than you want them to. “Waste A Day” squeezes a serpentine jam in the middle of a tight tune. “Wrapped Up Like Glass” veers into Pop-Punk territory but still swirls with tripped out sonic tracers. “Slippin’ Into the Sun” might contain the mantra of the whole record with the lyric, “I’m slippin’ into the Sun, but I’m not burnin’ up.” North Elementary certainly haven’t burned up, but they are on fire. “And Every Color You Have Ever Seen” is a testament to this fact. Reflex Arc joins Prison Books Benefit! RA wants you to come show love and support for those incarcerated and in need. See you there! 100% of proceeds go to Prison Books Collective (an all volunteer collective). Nicki studied vocal performance at the New School for Jazz & Contemporary Music in NY. She has performed in various venues from Japan to Paris, and has studied with Jazz masters from Shelia Jordan, to DeeDee Bridgewater, Drum Maestro Chico Hamilton, and mentored by pianist Jim Bell. A two piece experimental and improvisational band. Crowmeat Bob plays a variety of horns + sometimes electric guitar while Ginger Wagg plays a variety of body parts, spaces, and emotional states.